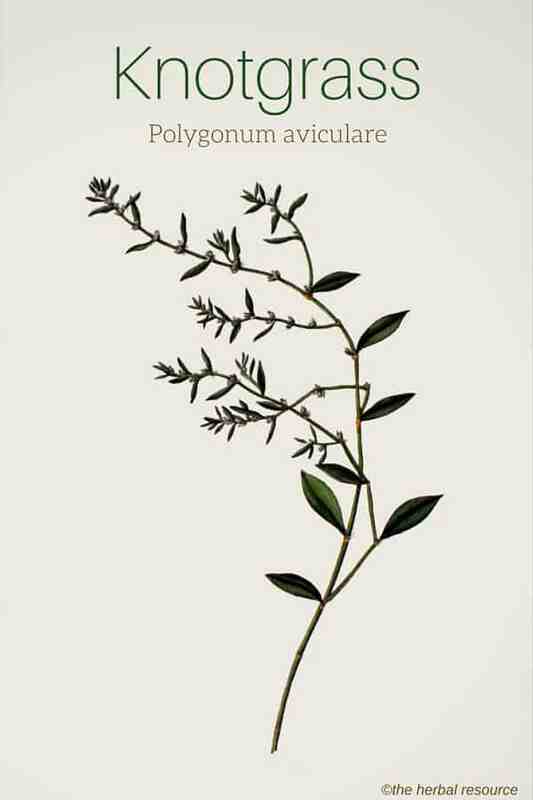 Botanical Name of Knotgrass: Polygonum aviculare. Other Common Names: Knotweed, prostrate knotweed, wireweed, beggarweed, doorweed, bird knotgrass, sparrow tounge, cowgrass, crawlgrass, centinodia (Spanish), bian xu (Chinese), Vogelknöterich (German), centinode (French), trampört (Swedish), vej-pileurt. (Danish), blóðarfi (Icelandic), tungras (Norwegian). 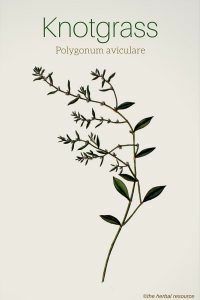 Habitat: Knotgrass can be found in almost all temperate regions throughout the world, and it is perhaps one of the most widely distributed plants in the world. It often grows in waste places, roadsides, railway embankments and along coastlines. It is also a rather common garden weed. It is especially in Eastern Europe that the herb is collected for medicinal purposes. Description: Knotgrass is an annual plant that belongs to the knotweed family (Polygonaceae). The plant is usually 5-15 cm tall, but may in some cases grow much taller. The stem is semi-erect and the leaves are short stalked and hairless. The plant blooms from June to September with 2-4 small, reddish to white flowers. The fruit is a dark brown, three-edged nut. Plant Parts Used: The aerial parts of knotgrass are used in herbal medicine. The plant is collected during the summer months when it is in bloom and then dried at 45 ° C.
Knotgrass is usually used in conjunction with other medicinal herbs in teas intended as a treatment for bronchitis and other respiratory ailments. Extracts of the herb are often added to standard herbal formulas used to treat coughs and to increase the production of urine. The seeds of knotgrass are very similar to the seeds of buckwheat (Fagopyrum esculentum) and just as starchy. Active Ingredients and Substances: The herb contains approximately 1% silicic acid which is partly water-soluble (0.08%) in boiling water. It contains 4% tannins, phenolic acids (caffeic acid and chlorogenic acid), coumarins (umbelliferon and scopoletin) and flavonoid glycosides (hyperin, quercitrin and avicularin). In addition, the herb contains mucins, tannins, traces of an essential oil, vitamin C and other substances. The content of tannins is presumably the reason why the herb has astringent and styptic properties, while the flavonoid glycosides are the reason for its diuretic properties. 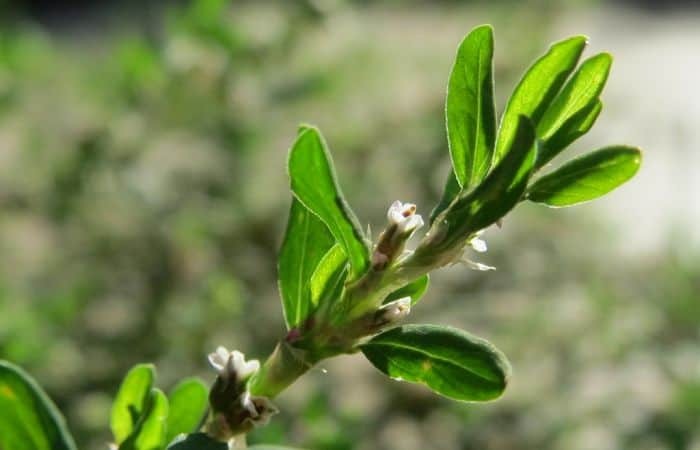 Because the herb contains silicic acid it may be helpful in strengthening the connective tissue of the lungs and in Europe it has been used as a remedy for pulmonary tuberculosis and chronic bronchitis. 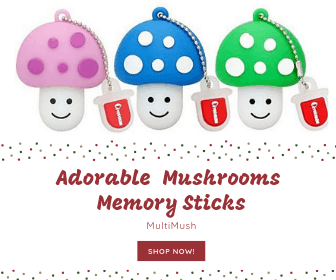 In particular, it has been used in conjunction with other long-term therapies. The herb’s earlier use as a treatment for tuberculosis has now only historical interest. In recent times knotweed is mostly used in teas due to its diuretic and disinfectant properties. In the past, the sap of knotgrass was used as a styptic agent and was especially recommended for nosebleeds. Some herbalists still prescribe a tea made from the dried herb as a topical astringent for bleeding hemorrhoids. Internally the herb is used in tea form as a remedy for many ailments associated with gastrointestinal system, such as diarrhea, ulcerative colitis and hemorrhoids and also for diseases related to the urinary tract such as cystitis, renal gravel and kidney stones that do not block the ureter. To increase the effect of the herb to treat ailments related to the urinary tract, it is recommended to drink at least 2 liters of water daily (including herbal teas). Furthermore, the herb has been used to treat mild respiratory tract infections and inflammatory conditions in the mouth and throat. A clinical study showed that the use of a mouthwash containing extracts of the herb for two weeks had an anti-inflammatory effect on gum inflammation. Knotgrass has also been shown have antimicrobial properties and that it could be useful as a treatment for fungal infections. The crushed leaves or a strong decoction of the plant can be used as a styptic and wound healing agent. In Chinese herbal medicine, the herb has been used for over 2000 years. There it has mostly been used to expel intestinal worms in children, for the treatment of diarrhea and dysentery, as a remedy for jaundice and gonorrhea, and as a diuretic herb, especially in cases when urination is painful. Scientific studies have not clearly been able to determine the herb’s exact mechanism as an astringent for external use, or as an internal remedy for diarrhea, but it is thought that the plant’s content of tannins is partly responsible for its effectiveness. The common dose of knotgrass is 1-2 teaspoons of the dried herb to one cup of water, simmered for 15 minutes and then strained. 1 teaspoon of the dried herb corresponds to approximately 1.5 grams and the recommended daily dosage is 4-6 grams. As a remedy for a cough and bronchitis, a cup of the tea 3-4 times daily might be helpful. A tincture can be made adding the crushed herb to 45% alcohol (one part of dried herb to 5 parts of alcohol). The mixture should be allowed to stand for eight days before the herb is filtered off. Recommended dosage is one teaspoon of the tincture 3 times daily. Knotgrass is considered a safe herb to use with few warnings and side effect. Excessive use of the herb should be avoided during pregnancy as it may have abortifacient properties. No contraindications, side effects or interactions with conventional medicine or other medicinal herbs have been reported.